Aleksandra's Note: Americans and Serbs from all over the United States and Canada gathered together on May 31, 1994 in Chicago to celebrate the 50th anniversary of the 'Halyard Mission' rescue operation and pay homage to the American veterans of World War II and the Serbs under the command of General Draza Mihailovich who had saved their lives. The 'Halyard Mission' was the name given to the greatest rescue of American and Allied lives from behind enemy lines in the history of warfare. It was a day of celebration, remembrance, gratitude and tears. For those that attended, it was a moving and unforgettable event. For the guests of honor, it was an opportunity to tell a story of epic proportions. 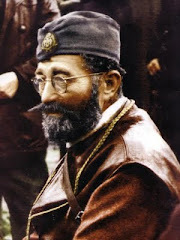 Fifty years before, in 1944, Serbian General Dragoljub Draza Mihailovich, his Chetnik forces, and the Serbian people loyal to them, saved the lives of hundreds of Allied fliers who had been stranded in Yugoslavia after having been shot out of the skies by the Germans while flying their bombing missions over the Ploesti oil fields of Romania. The goal of the Allied Ploesti bombing missions was to destroy Hitler’s main supply of oil at the time and bring the Nazis to their knees. Many of those who survived the severe German retaliation would end up wounded and stranded in Yugoslavia but would be saved, taken care of, and returned back to safety through the Halyard Mission rescue operation of 1944. In 1994, 50 years later, this rescue operation, which had more or less remained hidden from history for the past half century, was brought into the light of day on a grand scale for the first time. The operation was officially noted in all of the releases and information disseminated by the World War II Commemoration Committee in recognition of the 50th Anniversary of D-Day. That committee, chaired by Colonel Kenneth A. Plummer and overseen by the United States Department of Defense, organized a weeklong celebration in Chicago, Illinois in conjunction with special events taking place throughout the world to commemorate the milestone anniverary. This five-day D-Day 50th Anniversary commemoration in Chicago opened with the celebration of the 50th anniversary of the successful 'Halyard Mission' rescue operation on May 31, 1994. The Halyard Mission was a combined project of the American Office of Strategic Services (O.S.S. - precursor of the C.I.A.) under the command of General William J. Donovan and Lieutenant George ("Guv") S. Musulin of the O.S.S. 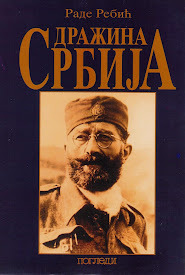 and General Draza Mihailovich and his Chetnik freedom fighters in the former Yugoslavia. For different reasons, and always less than noble ones, the Halyard/Ranger Mission rescue operation that took place over the course of the summer, autumn and winter of 1944 in Nazi occupied areas of former Yugoslavia was kept hidden from official public recognition and covered up, to the point of being left out of the historical texts relating to the World War II era altogether. The Halyard Mission became a casualty of political supression but through the tireless efforts of those who knew the story and significance of this great event, many of them who had personally lived it and are now deceased, this epic heroic story is now increasingly seeing the light of day. 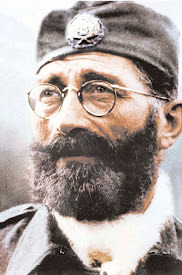 On May 31, 1994 in Chicago, Illinois, as the world began its commemoration of the 50th anniversary of D-Day, a fifty year debt of gratitude was repayed to Serbian general Dragoljub-Draza Mihailovich who was, and remained, the greatest hero of all to those who knew the measure of the man. As the festivities and commemorations continued throughout the week, the Serbs would be the only ethnic group so recognized for their contribution to the Allied war effort. There were a number of highlights, but among the most memorable was the presence of the Honorable Edward J. Derwinski, former Congressman and Secretary of Veterans Affairs, and a Chicago native, who joined us. He had played a very special and significant role in the Halyard story and was the first dignitary to speak. Mr. Derwinski set the tone for the commeration by a giving a compassionate, moving description of the significance of the Halyard Mission and the cover-up that had kept the story hidden for so many years. 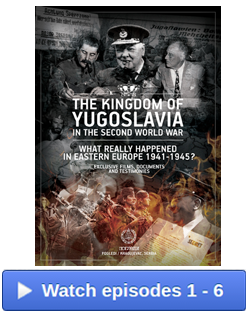 He reminded the world how General Mihailovich was not only betrayed internally by the Yugoslav communists but by external political forces that had a vested interest in keeping the Halyard Mission rescue operation one of the best kept secrets of the 20th century. Edward Derwinski was the person chiefly responsible for getting the esteemed “Legion of Merit” medal that had been posthumously awarded to General Mihailovich in 1948 by the United States declassified after 20 years of it being kept a national secret. He spoke quietly and emotionally and at the end became visibly moved, bringing tears to the eyes of many of those present. He received a standing ovation and was greeted back at his table by the airmen who remembered well his great service not only as a congressman, but as the former Secretary of Veterans Affairs in Washington. This was a friend, not only to them, but to the Serbs as well, for his outstanding service on behalf of truth and justice. Mr. Derwinski died on Sunday, January 15, 2012 at the age of 85. I am honored to have had the opportunity and privilege of meeting him in person and thanking him for his service. Below is the transcript of the speech that left such an impression on so many of us on that May 31st day in Chicago. "...the feat was a unique logistical accomplishment, and if you look at the obstacles that were presented there and look at the story, well, literally under the noses of the German garrison, they were able to fly these troops out, our airmen out....it's an amazing, amazing achievement. "...It didn't receive much attention, which is where my story starts. 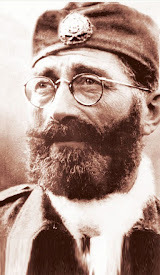 The reason it didn't receive much attention at the time was that long before General Mihailovich and his Chetniks worked out the arrangements to fly our Allied airmen out, the Chetniks, the Government of Yugoslavia, had been abandoned by the Allies who had switched their tactical support to Tito and the Partisans. At the time, General Mihailovich and his men were defending every possible tactical concern to get our men out. They already knew they had been abandoned, but despite that, they risked everything they had to rescue those airmen. "Now, shortly after that the war ended, and it took Tito ten months to finally capture General Mihailovich. Those of you who are old enough to remember, the Communists ran a rump trial, wouldn't let the airmen travel to Belgrade to testify on behalf of General Mihailovich, and they executed him. Then they tried to wash it away, tried to put it away as a little historical anecdote. 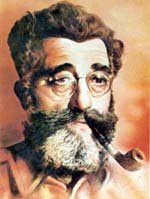 The facts are that General Mihailovich was probably the most effective anti-Nazi guerrilla warrior of World War II. "One month after the Nazis overran Yugoslavia, General Mihailovich was in the mountains with his men, starting this guerrilla war. Time Magazine gave them their front page cover as the first guerrilla warriors to challenge Hitler, and this was before the United States was in the war, before Pearl Harbor -- General Mihailovich was in the Serbian mountains launching his attacks against the Nazis. "What happened was that Mr. Stalin managed to convince Churchill and President Roosevelt that the Allies should only, only logistically support Tito. Mihailovich was left without resources, and eventually that led to his capture and execution. 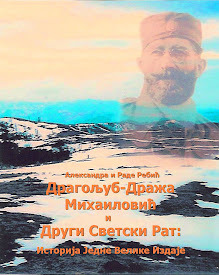 In the process, though, everyone who knew what was going on in Europe knew the value and contribution of General Mihailovich and the Chetniks, which is really demonstrated in a unique way, a tremenously unique way, by the Halyard Mission, in cooperation with the U.S. and Allied authorities. "...Then in 1948 President Truman bestowed the Legion of Merit Medal, the highest award that the U.S. can give a foreign military leader, conferred on General Mihailovich for his service on behalf of the Allied cause. It was immediately classified. The reason was that the officials in the United States State Department didn't wish to offend Mr. Tito's government. It remained classified for twenty years, until we finally managed to get the Defense Department to finally acknowledge that this award had been conferred upon General Mihailovich by President Truman. 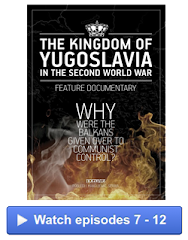 "That started, what I call, the revival of legitimate history in studying the role of Yugoslavia in World War II. As it has been noted earlier this morning, that if it hadn't been for the resistance of the Serbian guerrillas the Nazis would have had far greater resources for their invasion of Russia. The entire tide of the war may have changed if the Nazis weren't pinned down by General Mihailovich and his men, and their power siphoned off because of this, which led to their ultimate failure in Russia. "That's hardly ever mentioned, because we went through that terrible period, and the airmen can tell you, when they were rescued one of the things they found out was that they weren't supposed to discuss it. After all, our propaganda machine, the propaganda of the Allies, was already 100 percent in favor of Tito. "Now we've come full circle. It's been fifty years. We have a handful of airmen left who fifty years ago were saved by General Mihailovich and the Chetniks. They remember, and they've appreciated it, and they understand -- they understand what happened, and the story they're telling is being received much more effectively today than ever before. 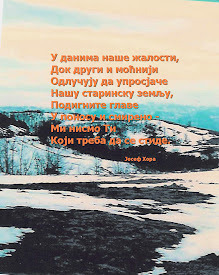 "In the meantime, Tito is gone, Titoism is gone, and all the troubles that we have in the current former republics of Yugoslavia, you can trace directly back to the mismanagement and misapplication of authority by the Tito Communist regime. 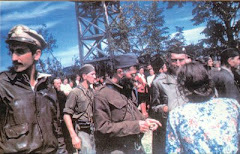 Had history been handled more effectively, had the Mihailovich Chetniks instead of the Tito Partisans received our logistical support, we wouldn't have the tragedy that is going on today. "...that unfortunately, there was a political decision made that was wrong - that was morally wrong, it was logistically wrong, politically wrong - that doomed General Mihailovich. "...but when it's all over what we want to leave behind when we've all gone is a record that objective historians can look at and say: 'This was the truth.' 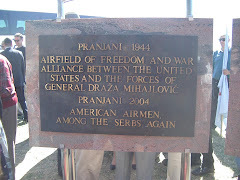 And that's what the issue before us is today - that we, in honoring these airmen who fifty years ago were nervously awaiting their rescue in the Serbian mountains, understood the problems, the technical problems, their rescuers faced and understood later in a very sad way, how the Allies had stepped away from this great man who had rescued them. "...We honor them today, and through their story we tell the remarkable story of this page in military history - a remarkable page in human history. And the remarkable, maybe not surprising, page of what a great man and his men, in this case the Chetniks, will do for the people they felt were Allies. And it's not surprising if one knew General Mihailovich -knew his dedication - dedication to his King, to his people, to his country. He was a patriot. He wasn't a partisan...he wasn't going to impose an artificial government as Tito did after the war...he wasn't going to arbitrarily and artificially cut up the provinces of Yugoslavia and create the present tinderbox...he wanted to create the freedoms...the freedoms of democracy...that the Serbian people had wanted since they had lost them in the Battle of Kosovo in 1389 and regained them step by step in the 19th and 20th century. He was a patriot...he was a democrat...he was a military commander who followed the orders of his authority. "So, I'm here to join you in honoring our veterans, honoring the Halyard Mission...honoring them first for their tremendous services, and the unusual, unique role they played in history - the history that they haven't forgotten. It's because of their determination and their perseverance that this story is now being told, honestly and truthfully, in the United States. "We had the prayer by our chaplains, and we'll probably have the benediction, too, which is traditional Orthodox, but, in the process, let us all remember that while we're in a very proper way celebrating this day, that somewhere upstairs, I'm sure, the old General is looking down and saying 'Thank you.'" The Honorable Edward J. Derwinski leaves the podium in tears.